Automatic transmission servicing. Most transmissions require fluid and filter change, as well as, minor adjustments. We are able to offer the draining and refilling, or flushing, of the torque converter. That means that all of the fluid is replaced, rather than one half or less. Four wheel drive front axle service. 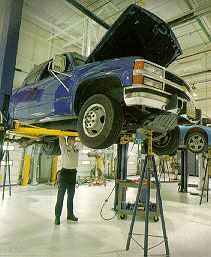 Many four wheel drive vehicles need front axle servicing. This includes inspecting and lubricating spindle bearings and seals, plus checking or replacing axle universal joints. Some of the more recent four wheel drive trucks use vacuum operated hubs that also require cleaning and new seals. Manual transmission, axle, and transfer case fluid change. Moisture contamination is the biggest reason that this preventative maintenance should be done.